! Talking Grape-ology: All that Sparkles is not Always Gold! Welcome back to another instalment of my wine blog for Create. I write this blog having just spent a most wonderful day visiting the magnificent Pommery Cellars in Reims in the heart of Champagne – all in a day’s work! Apart from having a lot of fun visiting the cellars and tasting quite a few seriously delicious Champagnes it got me thinking about all things fizzy – that’s what too much sun and Champagne does to you. All that sparkles is not always gold! 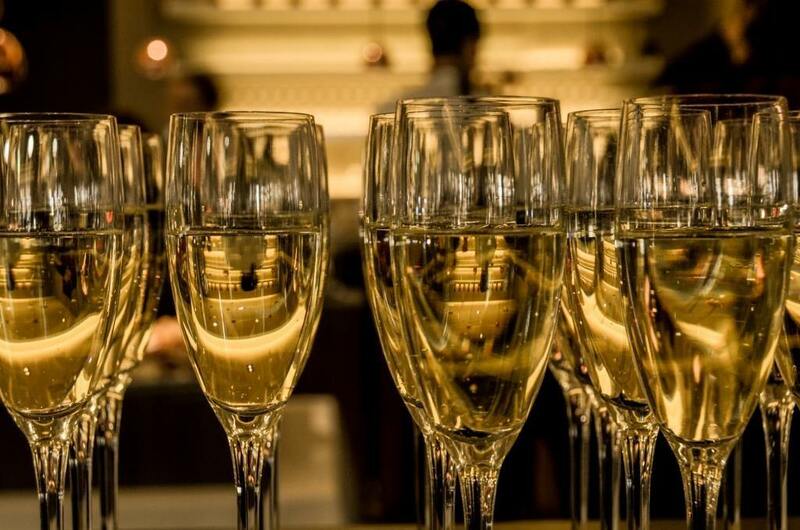 I love Champagne, it is one of life’s great treats and I thought I would explain what makes it so good and how it compares to Prosecco, which we all seem to be drinking by the bucket load. There is a significant difference between the two styles of sparkling wine but the price difference is getting ever smaller as Prosecco prices increase. The magic of Champagne happens in the bottle. The base wine for Champagne is made from three grape varieties: Chardonnay, Pinot Noir and Pinot Meunier. The two Pinots are, as you all know, black grapes but, as you also all know, the colour for red wine comes from contact with the skins. Therefore, if you press the black grapes, with no skin contact, then the juice is clear – hence you can make white wine from black grapes. The base wine for Champagne is made in the normal way, with the yeasts converting the natural sugar in the grapes to alcohol and CO2. The carbon dioxide escapes into the air. The magic for Champagne happens in the so-called secondary fermentation. The base wine is bottled and a liqueur de tirage (sugary grape must and yeast) is added. These are the bottles you see in the cellars, thousands and thousands of them gently maturing away. The second fermentation happens with the yeast converting the extra sugar into alcohol but, crucially, the resulting CO2 has nowhere to go, it cannot escape. That’s how the wine becomes fizzy. The other crucial difference is ageing. The minimum time that a Champagne must mature in bottle is 15 months, with many of the best Champagnes maturing for twice as long. Why does this make a difference? Well I’ll tell you why. The used up yeasts slowly decay in a process called autolysis and this adds flavour, depth and structure to the Champagne while it sits on its lees (the decaying yeasts). The longer the maturation then the finer and more delicate the bubbles will become. Complexity and structure comes with age. Pommery’s Brut Royal, for example, matures on its lees for 30 months – twice as long as the legal minimum. So the production process for good Champagne will take years. Then the lees are removed by the process of degorgement, whereby the visible bits and pieces (that’s a technical term) are manoeuvred into the neck of the bottle (using a technique called remuage) and then the neck is frozen, the cap is the removed and the pressure inside the bottle forces out the small block of ice. This leaves perfectly clear Champagne in the bottle and the bit missing is replaced with liqueur d’expedition. This will be made from the same base wine and naturally sweetened to the required amount. Brut Champagne, for example, has up to 12mg/l of sugar. The Champagne is then labelled, has a cork put it and is ready for sale – all in the same bottle. I hope this gives you a rough idea of the wonderful process involved in Champagne production and why there are so many different styles – due to the blend of grapes, the level of sweetness, how long the wine is matured on its lees and so on. It is a miraculous process that I never tire of seeing and enjoying. I’ll find any excuse to open a bottle! Prosecco is a very different process. We love it because it is so simple – like drinking alcoholic fizzy lemon juice. The Glera grapes are picked from the vineyards around Treviso in North East Italy and fermentation takes place in large sealed tanks. The carbon dioxide is trapped in the tanks and so the wine becomes fizzy. There is little or no ageing in bottle and the wine is produced to taste fresh, fruity and simple. The issue I have is that what is such a simple pleasurable and fun drink is becoming more and more expensive as the producers cash in on its popularity. As the price hits £10+ per bottle the difference in cost (and what you get in the bottle) between Prosecco and Champagne simply isn’t big enough. So given the choice I would drink Champagne over Prosecco but then I would wouldn’t I!